We hope this page will answer some of your questions; for any further information please call us for a chat. Can I hold a small party at Porthpean House? An event that caters for up to 30 people can be accommodated within the house. However the house is only equipped for 21 people (sleeping & eating). Over 30 people requires you to hire a marquee, generators and portaloos. It will therefore attract a different booking rate. Can I have my civil ceremony at Porthpean House? 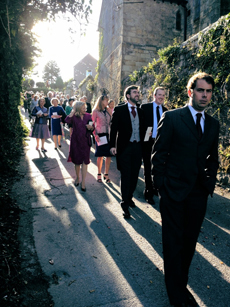 We are not licensed for civil ceremonies; St Austell is the nearest Register Office. The closest church is St Levan’s in Porthpean village. Can I have a wedding party at Porthpean House? The house holds a maximum of 30 people at any time. If you would like to hold your reception here it is necessary to hire in portaloos, caterers and a marquee (see below). Marquees for up to 150 people can be erected 2 days preceding the wedding. This means we may require a booking for longer than a normal week or weekend if your wedding is on a Saturday, as Friday is the normal changeover day for the house. For Example: Wedding party on Saturday requires 10 day hire. Marquee erected on Wed/Thurs and dismantled Mon/Tues following week. For Example: Wedding party on Sunday requires 7 day hire. Marquee erected on Friday and dismantled Tues following week. Marquees, generators and temporary toilets must be arranged by the hirer (see recommended suppliers below). Permission must be given for all decorations and fireworks due to the listed nature of the building and gardens. Extra parking can be arranged upon request.